So, I have been on a bit of an introspective kick lately. I don’t know if its the time of year, the point in my life, or just my allergies, but I find myself doing a lot of reflecting of late. I am not sure if anyone can really learn enough about themselves or where they fit into this deceptively, fascinating world. Actually, this is one of the reasons I took up photography. I wanted to be able to express, understand and capture the many moods, whimsical nuances and emotional layerings that are part of my own dynamic flux. What a great and truly amazing thing this photography stuff is huh? 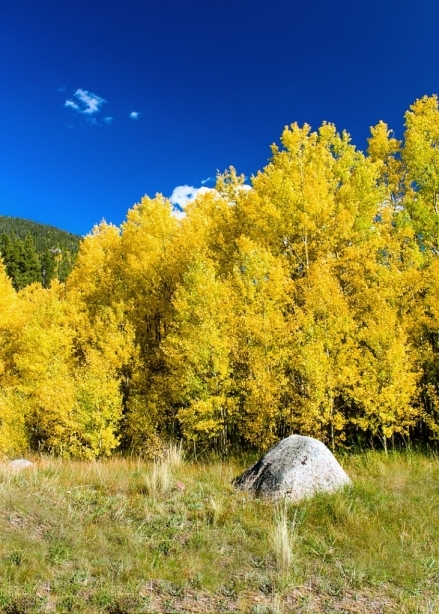 Being September in Colorado it is that time of year when the summer starts to wane and the last remaining golden rays of the sun kiss the leaves of the Aspen trees, painting the mountain landscape with a delicate warmth. As a photographer, this is one of my favorite times of the year. This last weekend, I packed up the photo gear, hopped into the car and headed up into the mountains to experience and be a part of the changing season. I spent a little over 5 hours up in the Rocky Mountains following the color wherever I could. It was a beautiful afternoon with only a few trace clouds in the sky and plenty of shooting opportunities. I stopped at several points to take photos, but was just having one of those days where I could not find the right composition. I would frame up vertical, horizontal, used the rule of thirds, changed my perspective from low to high, played around with some sun flair, and searched all afternoon for that one shot that would satiate my photo hunger. Sadly, I am not sure I found it. So, how do we deal with these disappointing outings? Should we go home, hang our heads and sulk the rest of the week? The reality, is that this happens to all of us. We can’t capture that perfect moment all the time and some days things just don’t gel. Believe it or not these experiences are just as important as those where we come home with an entire memory card of masterpieces. In fact, I would argue that sometimes these discouraging days are critical to our development and progress as a photographer. These are the experiences that make one want to work harder, learn more, and are a great reminder that one should constantly strive to be better and more proficient in their work. Here is how I approach these sorts of days. I go home and download all my photos just like normal. Then instead of immediately picking my favorites, I spend a little time analyzing why each composition did not work. Sometimes, I even review some compositional tips beforehand so my mind is sharp. I honestly have learned quite a bit by going through this process and it has only helped me in every successive shoot to be more aware of how I frame up each composition. Again, I think this is a very simple tip, but most of us get so focused on finding those good shots from our photo outings that we forget to look at our failures and invest the mental energy into figuring out why they failed. So, what did I learn from my fall foliage trip? There were times I framed vertically and should have framed horizontally. Some shots had too much foreground while others had no foreground at all. A few photos had no central focus or subject matter and a couple even had the shadow of my head (yes, embarrassingly enough) as when I looked through the viewfinder it was not there and then I proceeded to stand up (putting my shadow in the photo) and hit the cable shutter release. Look how much I learned from just that simple exercise. Took a total of 15-20 minutes to do it, and afterwards I had only refined my compositional skills. Although the drive through the luminous, golden, Aspen lined mountain roads was breathtaking and fulfilling, the shot above was the only keeper from the outing. It is not fantastic, but I like it well enough. Compositionally, the foreground (grass), middle ground (trees) and background (sky), break up the frame into thirds. The rock in the foreground and the point where the wedge of green mountains meets the trees are each at one of the power nodes of the Rule of Thirds. The complimenting colors of blue and yellow dominate the photo and that lone rock gives the viewer a point of interest and lends a bit of power and weight to the foreground. Reflecting back I wish I would have taken a few horizontally framed shots of this same scene, but that is something I learned for my next outing. All in all, don’t get bogged down or disappointed when a photo trip just doesn’t work and never let it mellow your photo buzz. Learn from it and use it to your advantage. You got into this hobby to capture the wonders of life and just like we learn important life lessons from mistakes and bad judgment, so can we learn from our monstrously, morose photo mishaps. After all, can you ever really learn too much?